My Blog is Up and Running! Welcome to my webpage and web log! This is my first attempt at dynamic webpage design with PHP and MySQL so take advantage of it and post a comment! And visit often because I plan to keep updating this page with pics, commentary, and goings-on that you won't want to miss. So, the last major event around here was a little hurricane called Wilma. Pictures of hurricane Wilma were posted recently from the front yard, backyard, around the neighborhood, around the city, and the aftermath without power. 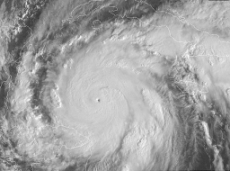 Wilma was a strong category 2 hurricane and left 98% of south Florida powerless. We had one day off work due to Katrina, another day off due to Rita, and five days off because of Wilma. I love the hurricane season! During the no-power days, we barbecued, gazed at the stars (amazing! ), swam in the lake, and biked around the neighborhood. It was kind of like camping. Anyway, Motorola is up and running and everything is getting back to normal. Enjoy the site! Hey Wade! Good job on the site. I can't beleive how dynamic it is! Well, see ya later. Thanks guys! Amy, congrats on your new house, the pictures look great! Nice job Wade. Now even with my pathetic dial-up connection, I can see your website better! And I have to agree with you--Congrats Amy on your new house!